Yesterday, I had the pleasure of seeing Maroon5 again. Prior to this, I spent time in the poly tunnel by way of a warm up. Singing,rather loudly, I might add. This involved putting manure into the poly tunnel and refreshing the soil. I also plugged in the vast majority of tomato plants bar one. Bar one, as the plants are still only two inches high. The concert was epic, and I enjoyed it thoroughly. Have now seen Maroon5 four times in ten years, and I was twice the age of their current fans. Maroon5 on shuffle tends to be what I have playing on the plot, all the time. Many slugs, have been slain, to the sound of Maroon5. Something about the vocals and guitar. Anyway. 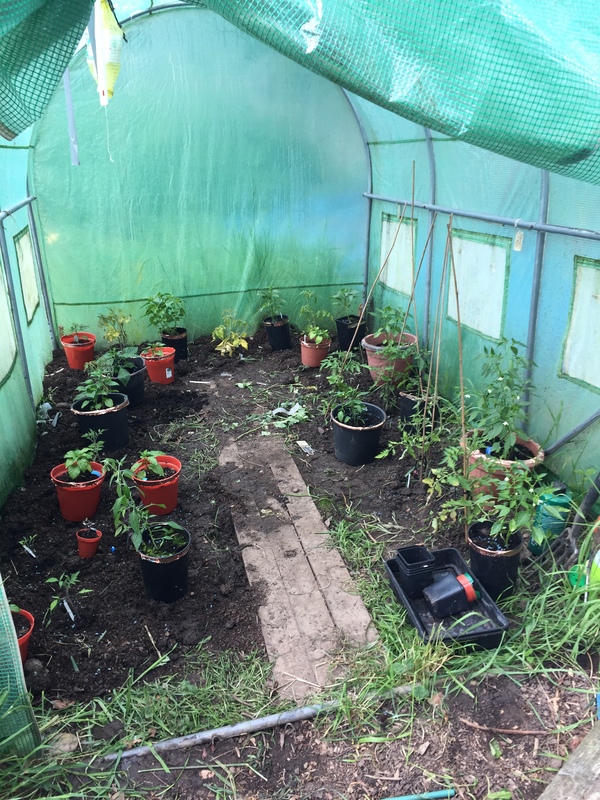 the poly tunnel. This morning, I went to water the contents. We have vast variety of plants in there as listed below. Above is the purple haze. This along with the Dorset Naga was purchased from sea spring seeds when they had a stall at the edible garden show. I bought plug plants of these two as the time had passed to sow from seed. 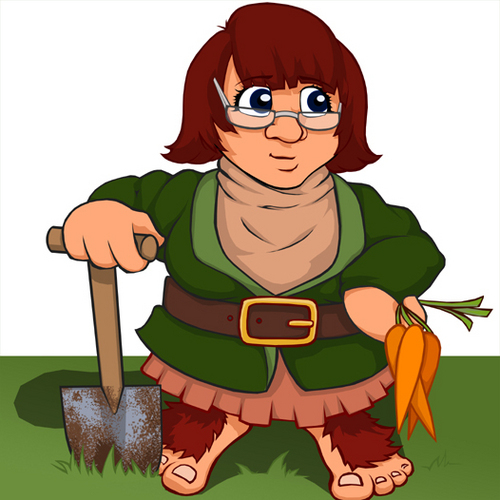 Otherwise, I have sown and grown all the plants from seed. 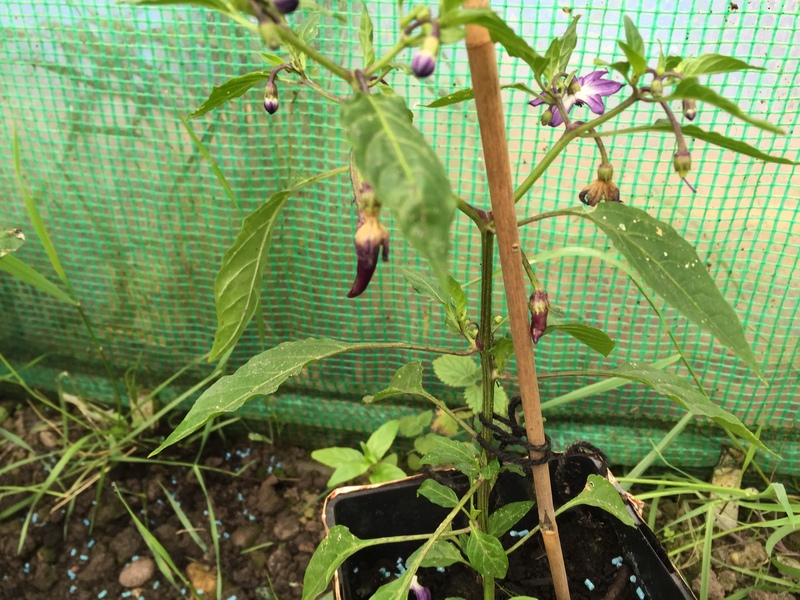 As you can see, there are two tiny purple chillies on the plant. So far, this is the most productive chilli plant, those are chillies number two and three! making this year already more successful than last year. We have had a spot of drama though, in having an aphid attack. The poor plants are only just starting to recover and send out new leaves. Lessons have been learned from last year. The chillies are in pots, and not in open ground. The result being, that the plants look happier, are more productive and don’t send out lots of bushy foliage with no flowers. Even the small plants in the brown pots are sending out flower buds. The additional benefit is that the pots can be moved around as things-fingers crossed-grow. I have one absent chilli-pettie belle-that is still to move on, plus four aubergine plants that are still being nursed at home. Having had a mild panic last week with the tomatoes nearly dying, five of them have been transplanted. Think there are are dozen or so plants left to sink in the poly tunnel. 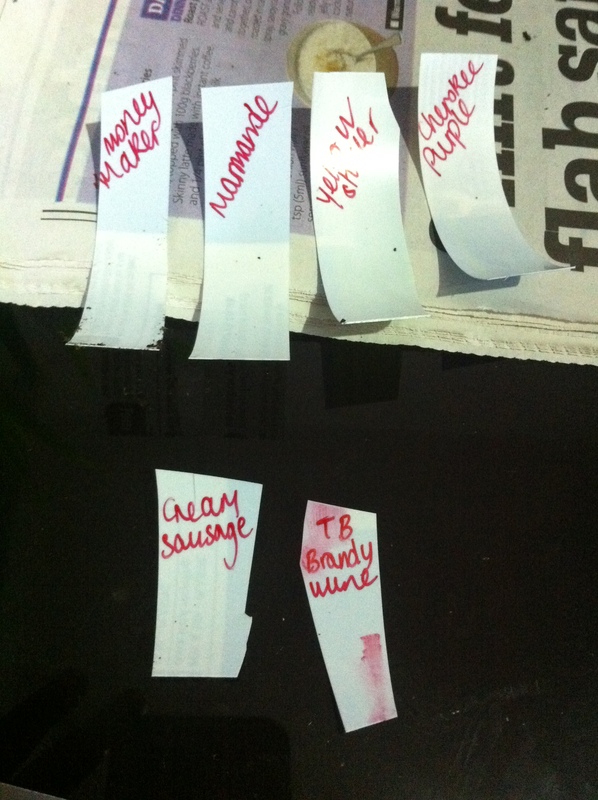 Think the one’s in the photo’s are marmande, true black brandy wine, money maker and cream sausage. A majority of the plants are tall, and leafy; with some now starting to bloom and set trusses. The true black brandywine, is a heritage variety, a number of them are this year in fact; and that has just started to form fuzzy yellow flowers. These are quite different from your average tomato flower with its propeller blade shaped blooms. The plan is to sink the rest of the plants in the coming days having refreshed the soil a little. The tomatoes will then be bunk mates with potted chillies and maybe, maybe even this years aubergines that are only just getting a wiggle on. Window sill shuffle is happening once more. The tomato plants, the first batch, had been sat in the four tier blowaway for some time. They have largely been growing quite vigorously, were becoming quite large for the small green house. There is a second, more diminutive batch remaining. The larger ones have now been transferred to the wendy house, the larger green house on the plot. They are still fleeced, as I really don’t want to take any chances at all. They are eventually going to go into the poly tunnel, once the red duke of york potatoes have been dug up. That might not be too long, since the leafy red and green foliage is quite rampant at the moment. Five of the remaining habanero plants that are at home, have now taken the place of the larger tomatoes. There are still about half a dozen smaller tomato plants, that have yet to get a wriggle on. Today has been a rather sunny Easter Monday Bank Holiday. As it was rather warm, I had a check of the tomatoes. As you can see, there is fleece, black trays and recycled milk bottles filled with water. The tomatoes are still there, looking a bit purple stemmed, but still there. Whilst it was lovely and warm during the day, there sun has disappeared and there is a chill with thee being no clouds. I think I have another half a dozen tomatoes sat inside that would benefit from being potted up. Then I will have a full complement of tomatoes to be pampered in the 4TB, They are going to be in there a while, I don’t plant to stick them in the poly tunnel any time soon. Even then, the chillies and tomatoes are likely to be sent out together. That’s if they both survive. There was a spot of chilli drama today, with the cayennes nearly dying through intense heat. These had to retrieved and hydrated pretty quickly. I think they are still soaking as there was very near crispiness for a couple of plants. Stay safe, I am closing the door, all right? The lovely Not Just Jams was talking about how she had put her tomatoes into her insulated greenhouse, with fleece. And I thought I might risk it. Not Just Jams also that she had had hot water bottles. Think that was milk bottles with water in, that heat up naturally. 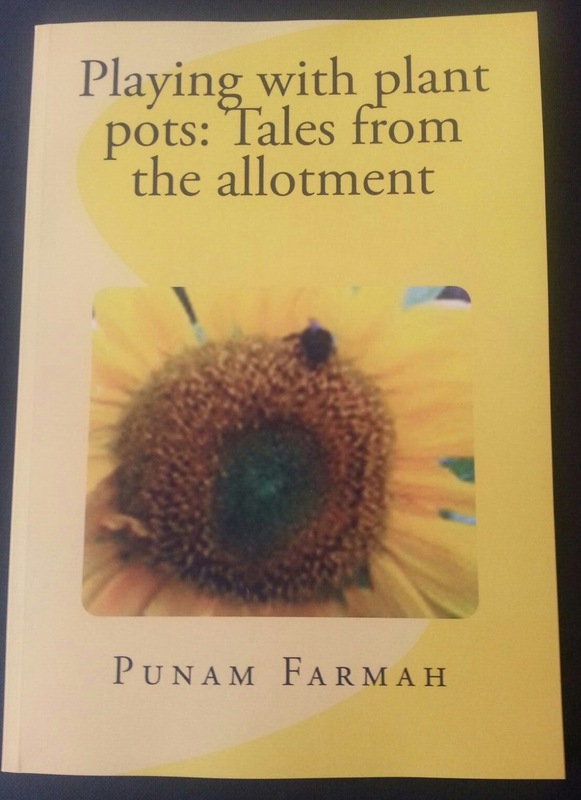 And since she is lovely, and has given me a lot of valuable ‘lotment and preserving advice, thought I might try some of her ideas. I didn’t get as far as the hot bottles. If only I had nabbed some out of the recycling that went out yesterday. So I scampered this morning to tidy up the four tier blowaway, that has housed nothing but trays and things since last summer. I also need the window sill space. In the coming month, different things are going to get sown. I did fleece the top deck of the 4TB though, and line it black bin bag. From GCSE science, that absorbs heat and light, as does the black trays. So here’s hoping to trap the heat. And now I am a scared. That these pampered things are not going to make it til sunrise. They were starting to sulk whilst they were just sat on the flagstones whilst the sun was out. They are fleeced. In that I have managed to create a box with it on the top shelf. Two sheets of cut down fleece are placed at right angles to one another to cover the four sides. Closed the door, and I shall try and sleep tonight. The poor things. Just like the chillies, the tomato babies are growing slowly but surely. The first batch are somewhat leggy, and would most likely benefit from being potted up. This is a plan in the coming week at least. Shall be keeping an eye on them,and rotating as some have started to bend with the solar phillic tendency. Some of varieties have started to send out proper leaves, whereas others are somewhat delayed, I would rather that they did take their time at this stage, I don’t want them grow too quickly and then keel over should we have a cold snap. They are largely kept warm, but not too warm so as to be in heat all the time. Haven’t got around to sowing any additional varieties, and I’m not sure that I want to sow any more. There is finite space in the poly tunnel, which will have tomatoes sharing with chillies. Since we are sowing seeds. Why leave the tomatoes out? I have sown them at time of the year before. Only to have wiry, gangly leggy creatures that I didn’t pot up quickly enough. I’m not very good at both potting on, or pricking out for that matter. I stood in Dad’s loft, it was cold up there, rooted in the seed stasher to pull out the seeds. I didn’t have as many as I had thought, but that didn’t make the selection of seeds any easier. Laying out the packets, it was a cross between laying out solitaire cards and X factor selection. You might think, that a tomato is a tomato. Not quite. Trust me, there are people out there who will have strong views on that matter. There are quite a few heritage/heirloom varieties in this particular experiment. Last year, I had a few that were shop brought plants. Wiry and tall to begin with, with slightly odd leaves. These did actually take sometime to get growing. The plants did grow large well, but were slower to produce the bigger, beefsteak fruit. Yellow stuffer-This made the lovely yellow chutney last year, so same again, please. Marmande-big beefy beefsteak. Very productive last year, knobbly decent sized tomato. Cream sausage-hilarious name, but actually yellow. True black brandywine-another beefy beefsteak. But what looks likes like a Gothic fruit. Did have a shop brought Brandywine last year, the name escapes me. Moneymaker-I have to have one bog standard red tomato, so mum doesn’t protest. It was toss up between this variety and Gardener’s delight. Cherokee purple. I brought one of these last year as a plant, from a local greengrocer. Big plant, big fruit, but not bad. I do have a sense of trepidation about sowing this early. Not least of all because they all might germinate like triffids and become leggy.Must keep an eye on them, make sure that they get potted up as soon as possible. Seeds were modularised, twenty four modules. But not a lot of seeds, at this stage. Plus, I have to consider window sill space. If they all do come off, then there is the small matter of them ripening.